Hey – that’s not my giraffe! BREAKING NEWS • About 4 minutes after I posted this, Strava tweeted about my giraffe again with the faulty link all fixed up. Kudos to Strava! When Strava tweeted a shout-out for my Strava giraffe yesterday, I was elated. Obviously. 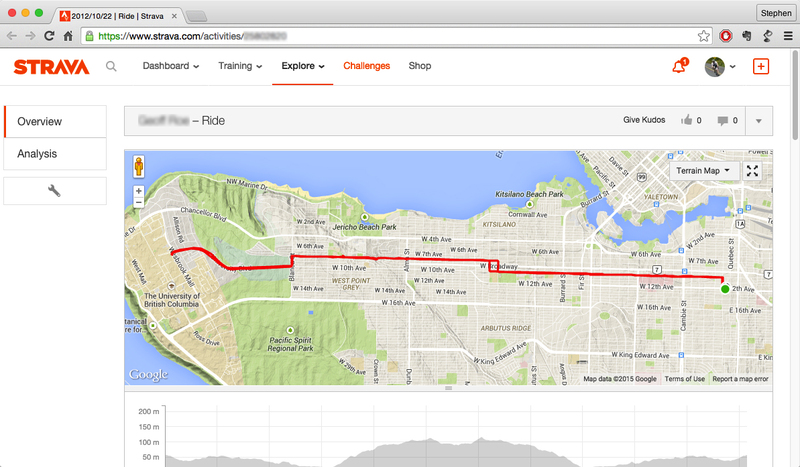 Today, my giddiness took a bit of a tumble when I discovered the link in Strava’s tweet was missing a digit. As a result, any of Strava’s 71.1k Twitter followers who clicked through to see my giraffe on Strava.com saw the image below instead. On the bright side, the post on Strava’s Facebook page got the link right. If you were seeking my giraffe and found this instead, don’t despair. You’ll find her here. This entry was posted in gps art and tagged animals, bicycling, creativity, cycling, cyclist, garmin, giraffe, gps, gps art, strava, strava art, victoria bc. Bookmark the permalink.